We all love the summer sun, but when it beats down, we also know it’s best to shade your baby. 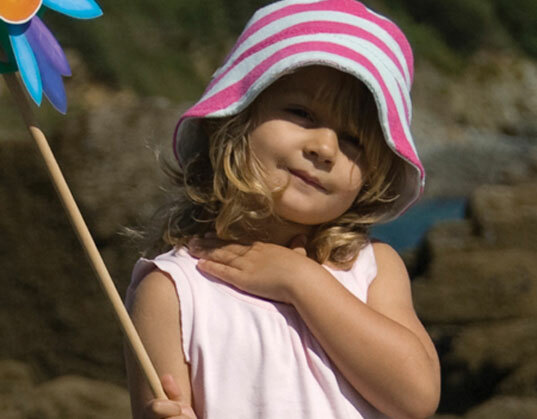 Frugi’s organic sun hats are both adorable and functional saving sensitive skin from strong rays. Made from 100 percent organic cotton terry the little bucket hats are reversible from stripes to solids in both pink and blue. And since a new study from the Environmental Working Group found a mere 8 percent of sunscreens are safe and effective, finding as many other ways as possible to keep the sun off your tots skin is important. We all love the summer sun, but when it beats down, we also know it's best to shade your baby. Frugi's organic sun hats are both adorable and functional saving sensitive skin from strong rays. Made from 100 percent organic cotton terry the little bucket hats are reversible from stripes to solids in both pink and blue. And since a new study from the Environmental Working Group found a mere 8 percent of sunscreens are safe and effective, finding as many other ways as possible to keep the sun off your tots skin is important.